Hi, welcome to Zane's Magic Shop. 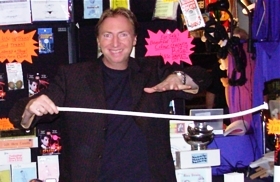 As a passionate magician with many years experience in the magic business, I have seen and used hundreds of tricks and illusions so I know what works and what doesn't. Within this shop I have collected a large selection of the best tricks available. I'm a working magician and regularly use these tricks in my own acts, so I can guarantee they work - and work well! This online shop has been in business since 2004 and has grown to become a very busy and successful shop that both professional and amateur customers keep coming back to time and time again. The fact that we have a lot of repeat business says a lot about the way we do things and how well we treat our customers. For us, customer is king! This is why, unlike a lot of online shops, we put our phone number on the web site so you can phone us with any, and all questions. If in the unlikely event you have a problem, you can phone us with that too. We source tricks, both from the UK, and from all round the world. We have a very large selection available on this site, but if there's a particular trick you can't find, contact us and we'll try and find it for you. Because we sell so many tricks both online and at magic conventions, we can buy in bulk and pass on the savings to you. This means we have some of the cheapest prices on the Internet! New stock is often being added to the shop, so keep coming back to find out what's new!